A parent of two young children, trained as a scientist, and currently a biotech consultant. I’ve spent the past few years exploring innovations in education and am curating a newsletter of “ideas to consider and things to check out” for engaged parents. When I first fell down the rabbit hole of exploring education, some of the most interesting ideas I came across were from the homeschooling community. Why was I, a secular, urban, biotech consultant and mom of two, listening to homeschooling podcasts by Christian conservative stay-at-home moms of four or more in small-town America? Having grown up in a testing-focused Indian school system, hearing about an education that was interest-driven and included regular nature and museum outings and lots of reading time sounded idyllic. But as a parent of two young children, I also thought, “Sounds fun for the kids, but who were these parents? Saints? Psychos?” Being a child’s parent AND primary teacher seemed like a huge responsibility, especially given some of these parents also held paying jobs. The term ‘homeschooling’ often conjures up visions of families removed from the mainstream for religious reasons or fear of popular culture. And indeed, a large proportion (64%) of homeschoolers in the U.S. cite religion as an important reason for their choice, but the group is highly diverse and includes a growing number of urban, secular, tech-focused households that are dissatisfied with traditional schooling. While only a small proportion (3-4%) of U.S. kids between age 5 and 17 are home-schooled, the movement has grown in recent years. Most homeschooling families are still likely to be white, Christian and middle-class, but there are growing numbers of families who aren’t (many of whom can afford elite private schools), and choose homeschooling so that the family can have a say in both what and how their children learn. Indeed, the desire to create a bespoke educational experience has lead some parents to hire an army of tutors to homeschool their children in multi-million dollar homes customized for schooling. There has also been a growing trend toward combining home and school-based learning, with specialized learning centers and blended learning schools offering parents what is arguably the best of both worlds. Needless to say, with personalization being a major focus of homeschooling, there are about as many different styles of homeschooling as there are families participating. From families who basically ‘do school’ at home, to blended, project-based or literature-based homeschooling, all the way to unschooling, there is a huge range, making generalization impossible. But there are some core values and beliefs many of these families share, which are worth a closer look (even for those of us who aren’t tempted by the homeschooling option). In other words, you as parents take the time to think through your definition of “well-educated”, and what you value in your child’s education (which may not align completely with your child’s school agenda). Of course, most parents do this already, and often extra-curricular activities such as sports and music are chosen in an attempt to fill gaps at school, but it can be helpful to have an explicit family priority to base these choices on. If not chosen in an intentional way, extra-curricular activities can easily take over children’s schedules and limit the white space they need to develop their own interests. Which brings us to the other key driver of homeschooling curricula: the child’s interest. Homeschooling families obviously have the freedom to follow the interests of the child in a way that traditional schools can’t, but we can be mindful of these interests at home, and respect and encourage them if reasonable. Homeschooled kids often take much greater responsibility for their own learning and self-direction is one of the key advantages that homeschooling offers. In a similar example, an Indian friend of mine in Boston, herself raised in the U.S. and married to a non-Indian, started an ‘India school’ to teach her own and friends’ children the language and culture of the sub-continent. Of course, both school-going and homeschooling families can suffer from the perils of ‘extreme enrichment’, but it’s more likely to be genuinely enriching and have deeper, long-term value, if both the parent and child’s interests drive the family decision on whether and how to supplement schooling. This one is admittedly trickier to replicate with school-going kids than filling ‘content gaps’ one finds in schools, but it’s often a major motivator for homeschooling. Helping kids ‘learn how to learn’ in a self-directed way is a particular challenge if they attend a testing-focused school. Some homeschooling families select a blended learning model, with self-directed, online work combined with in-person, hands-on projects. Others tailor the homeschool experience based on each child’s learning style. It’s challenging as a parent to figure out what your child’s learning style is, but one of the biggest benefits homeschooling offers is this customization to the child’s way of learning. Some children thrive on worksheets and external motivators such as grades and teacher’s approval, while others struggle with those constraints and learn better through making and doing. While ‘hands-on’ and ‘project-based’ learning are now buzz-words in schools, and even the most traditionally ‘academic’ schools recognize their value, it is still rare to find a school where it constitutes the core learning methodology. Another important difference in how homeschooled kids learn is in the amount of free time they gain. Academic subjects can often be covered in 2–4 hours, leaving them significantly more time than school-going children to engage in other activities. However they spend it — playing, reading, making, or playing video games, it is likely to help develop their own interests. This white space is something school-going families have to make an effort to protect, but if we want our children to grow up learning more than how to follow instructions, this free time maybe more important than any ‘enrichment’ we could offer them. Thanks again for reading and would love to hear your thoughts! 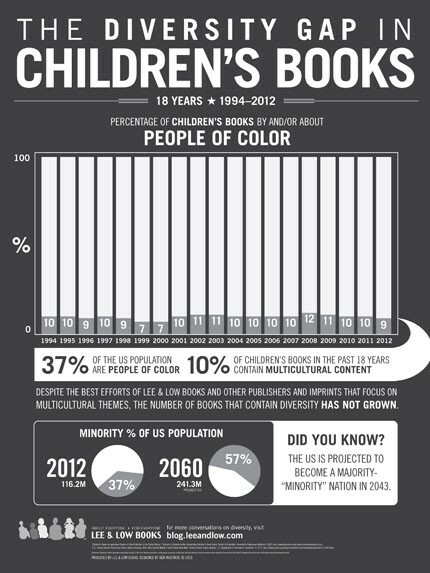 A great distraction from election trauma – pick up more children’s books! While I waxed on about the importance of reading aloud to kids, children’s books (yes picture books too!) are wonderful for adults too. Maria Popova and Gretchen Rubin are fans – check out their faves. 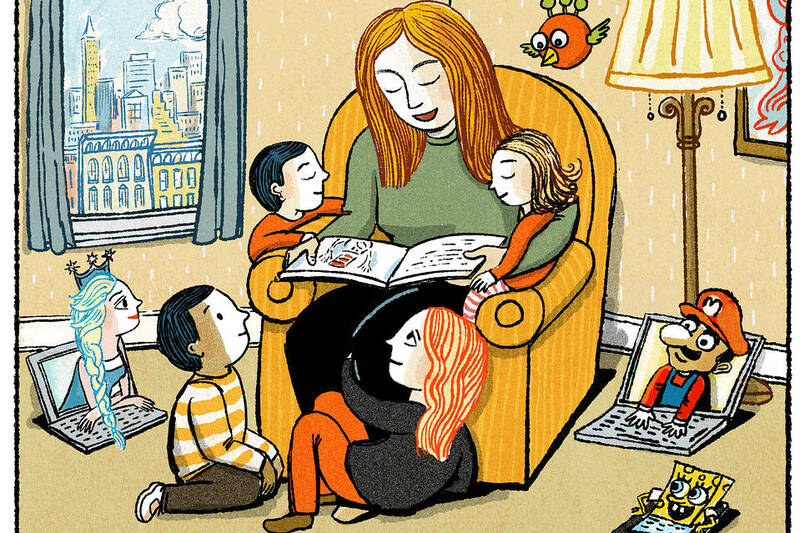 I missed this article below in my previous post, but it’s a wonderful reminder from the Wall Street Journal’s children’s book critic Meghan Cox Gurdon on the joy of the read aloud tradition and its vulnerability in the face of increased screen time. Pasting it below in its entirety (minus ads!) because it’s worth a read. Original can be found here. It was followed by some great comments here. Happy reading! To curl up with children and a good book has long been one of the great civilizing practices of domestic life, an almost magical entry point to the larger world of literature. The first time I read aloud to one of my children, the experience ended in tears. It was a sweltering July afternoon 21 years ago, and my husband and I had, incredibly, just been permitted to leave a Tokyo hospital with our firstborn, a daughter. Immediately upon entering our apartment, feeling foggy about all but one thing, I carried the infant to the little room we had prepared for her, sat down in the rocking chair that I had painted before her arrival, and began to read aloud from a book of fairy tales. The hot summer sun slanted through the windows. My voice sounded querulous and strange. The child lay oblivious. Was she even listening? Was I supposed to show her the illustrations? With a sudden sense of personal absurdity, I started to bawl. Things quickly improved, but honestly, what kind of a maniac reads “Cinderella” to a newborn? Reading aloud was probably always going to be important in our family life, but it might never have acquired its tinge of benign extremism without the influence of my friend Lisa Wolfinger, who had started having babies a few years before I did. It was she who first modeled for me the joyful primacy that reading aloud could command, even in a busy household. She read to her four boys every night, at length and almost without fail. I remember being at a dinner party at her house in Maine when her sons were quite small. During cocktails, she excused herself and disappeared upstairs. She was gone so long that eventually someone asked her husband if anything was amiss. “Oh, no,” he said. “She’s just reading to the boys.” Any chagrin that we might have felt at being stranded by our hostess was replaced by amazed admiration—and for me a determination to do the same for my own children, if I ever had them. Well, I did, five of them, and since that first hysterical episode in Japan I’ve read aloud to all or some of them virtually every day. It has been one of the great joys of our family life. It is also increasingly a torment—a torment because as children get older the schedule gets busier; because it’s ever harder to get literary classics into children’s minds before they see the Hollywood variants; because childhood itself is fast disappearing into the bewitching embrace of technology. “I do think that people, in the rush and clamor and get-things-done-ness of daily life, need to be reminded about what reading aloud can do,” says author Kate DiCamillo, a Newbery Medalist and evangelist on the subject. Certainly in the modern era there is something quaint about a grown-up and a child or two sitting in a silence broken only by the sound of a single human voice. Yet how cozy, how impossibly lovely it is! Unlike tech devices, which atomize the family by drawing each member into his own virtual reality, great stories pull people of different ages toward one another, emotionally and physically. When my children were small, I would often read with my eldest daughter tucked in by my side, the boy draped like a panther half across my shoulders and half across the back of the sofa, a tiny daughter on either knee, and the baby in my lap. If we happened to be on one of our cycles through “Treasure Island,” Robert Louis Stevenson’s swashbuckling classic, my husband would come to listen, too, and stretch out on the floor in his suit and tie and shush the children when they started to act out the exciting bits. She’s right, of course. When you read “Goodnight Moon” with a toddler who sits trustingly on your lap, gazing at the page with rapt absorption; when you ask her to “find the mouse” and she pokes out a finger and earnestly touches the page, you are in that patch of warmth, the both of you. When you read “The Story of Ping” to a slightly older child and notice him wince at the moment when Ping gets smacked on the bottom after spending all night out on the Yangtze River; or when you get to the scene in “The Wind in the Willows” when Mr. Toad sees his first automobile and the children laugh out loud at his rapturous cries (“O poop-poop! O my!”), you are in that patch of light. The evident pleasure of hearing a story read aloud is not confined to the young. Even teenagers (and husbands) will listen if the writing is good. So it seems a shame that, in many households, parents read to children only until the children are old enough to read by themselves. In the golden, misty days of yore—a decade ago, say—that could safely establish a pattern for life. Reading aloud was a kind of grand gateway, beautiful in itself but also an entry point to the larger world of literature. It was understood that a child who learned to love stories by hearing them would be a child who would willingly graduate to more sophisticated literature for his own reading. Alas, this assumption is no longer so easy to make. In an epoch in which screens of one sort or another have become ubiquitous, it is more vital than ever to read aloud often, and at length, for as long as children will stay to listen. Without sustained adult effort, many kids won’t bother going through the gateway at all. I know a voracious young reader who stopped consuming novels for pleasure for almost four years after she gained access to a laptop. In our family, the attempted usurpation by electronic entertainment has struck each child progressively at an earlier age—not because I’m a feckless mother, I hope, but because that is the way the culture is going. If the drift to YouTube and Instagram and Hulu has happened in our household, a book-obsessed place that is stuffed with gloriously varied volumes thanks to my day job as this paper’s children’s book critic, how must it be elsewhere? Technology has “deformed the childhood of my sons,” a friend says bleakly. Like mine, her children span the time before and after the mass use of computerized devices, before and after the deluge of online-ism—a coinage dangerously close to onanism and perhaps not far off the mark—and she notes a distressing difference between even the media saturation of her 17-year-old and his 13-year-old brother. The younger boy had less time to grow up without pixels, and it shows. It was for that reason that I tried furiously, when my children were small, to stay ahead of Disney and other well-meaning cinematic manglers of classic children’s literature. Not that movie adaptations are necessarily bad, but they do tend to colonize the mind. I wanted my children to conjure sublimely odd, fabulously idiosyncratic stories such as “Alice’s Adventures in Wonderland,” “Peter Pan” and “Winnie-the-Pooh” in their own heads, for themselves, before they internalized the animated renditions. It was hard, and it’s getting harder. A second-grader too young to tackle the Harry Potter books almost cannot help seeing them onscreen, or bits of them, and thus will envision Maggie Smith as Prof. McGonagall before he opens the first volume in the series. That Hollywood has been interpreting children’s literature since its earliest days—think of Shirley Temple in “The Little Princess” (1939)—is a reminder that the race against the machine predates the invention of the iPad. For 45 minutes or an hour adults can give children—and themselves—an irreplaceable gift, a cultural grounding, a zest for language, a stake in the rich history of storytelling. That’s not so long, surely? There will be plenty of time afterward for everyone to go back online. —Mrs. Gurdon writes about children’s books for the Weekend Journal. On the importance of reading aloud to kids (even after they’re reading independently)…. Like most parents of pre-literate children, we read aloud daily to our 6 and 4 year old kids as a part of our evening routine. 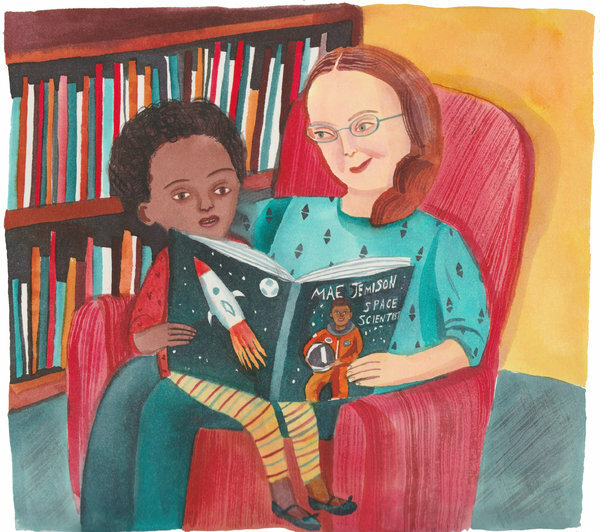 The benefits of reading aloud to this set are well known; access to the world of stories being the most obvious, parental connection and shared enjoyment of stories being others. Fun aside, reading aloud is widely recognized as the single most important activity for literacy acquisition (SO SERIOUS, but still, no surprise there!). But what about older children who can read independently? They are often eager to read alone, and can be impatient with the slower pace of read-alouds, making them reluctant listeners. But it’s increasingly acknowledged that even fluent readers gain a tremendous amount from being read to. As Jim Trelease, the author of the Read Aloud Handbook points out, a child’s reading level doesn’t catch up to his or her comprehension level until around 8th grade. Reading aloud to this literate set can provide access to more sophisticated literature than they’re capable of comfortably tackling themselves, not to mention strengthen their listening skills and patience (which may have amazing real world benefits!). As the passionate TEDx speaker below and the author of this piece on KQED’s MindShift describe, there are other reasons it’s a good idea to continue reading with children as long as they will let us. For one, the physical closeness that reading aloud usually brings creates an effortless intimacy (already something that I appreciate with our no-longer-snuggly six year old). We can ensure reading is a fun, shared experience that is joyful, rather than stressful (particularly important for beginning or struggling readers). It also offers parents an entry point to help children think through big issues — social, emotional, or geopolitical — which are challenging to address through direct discussion (or the snoring parental lecture!). Choosing books for the family read-aloud also lets parents introduce books that kids wouldn’t pick themselves (while we get to sneakily broaden their horizons — I’m looking at you, Thomas the Tank Engine and Star Wars!). At our house, we usually let each child choose one picture book (or section of a long chapter book) and choose one ourselves (it takes anywhere from 15–30 minutes total for all three choices). For us, reading aloud is also an easy way to introduce French and Indian stories, places and culture to our children. Just 15 minutes a day can make a difference! An area where reading aloud to older children can be more directly helpful is when reading the likes of Dickens and Shakespeare. As Jessica Lahey, educator and author notes in the Atlantic, she often reads aloud in her 7th and 8th grade classrooms, because “it’s the best way to ease students into challenging language and rhetoric.” Listening is also no doubt the best way to encounter poetry and verse, and language such as Shakespeare’s, meant for performance. Begin reading aloud to children at birth (American Association of Pediatrics recommends that pediatricians promote reading to children from infancy). The first time you read a book, ask “What do you think this is going to be about?” (I rarely do this, or really discuss the stories much, but will try and remind myself to do this and also take a moment for discussion at the end). The most common mistake in reading aloud is reading too fast. (Guilty as charged!). Slow down enough so children have enough time to look at pictures (if there are any) and more importantly, to build mental pictures of what they’ve heard. It’s ok if very young children (or older ones!) can’t focus for too long. Sometimes, letting them doodle or build with Lego while listening can help. And most important….Focus on the fun! Personally, I just can’t resist the warm glow of a story myself. The opportunity to read all the children’s classics I never had access to and experience them for the first time along with my kids is too good to pass up! Happy Reading everyone (and thanks for reading this)! What are some favorite read-alouds at your house? Do you think reading to independent readers is important? or a recipe for disaster? Was reading aloud a part of your own childhood? Love to hear your thoughts, as always! What are the best stories to read aloud? How to Get Teens to Read: August 24, 2016 On Point episode with Tom Ashbrook and guest David Denby, New Yorker writer and author of Lit Up: One Reporter. Three Schools. Twenty-four Books That Can Change Lives. Great reminder of how the focus on pleasure is the key to raising a reader! The Father-Daughter Reading Streak that lasted nearly 9 years — NPR’s story on Alice Ozma and The Reading Promise: My Father and the Books We Shared.